Elika is an exclusive buyer’s broker with over 20 years of experience and knowledge. We represent individual and institutional foreign clients. Elika provides complimentary buyer’s representation you can depend on. New York City real estate is popular among international buyers due to its location, limited landmass, transparency, political stability and capital appreciation. Whether you are looking for an investment property, new construction, pied-a-terre or relocating to New York, our specialized buyer services make the process stress free and rewarding. Elika works for you providing independent information, expert advice, and comprehensive knowledge to help you find and secure the ideal property for the best possible price. To help answer any immediate questions you may have with buying New York real estate as a foreigner, please refer to our guide below. Let Elika’s experts search, filter and send you the best available Condo apartments for sale that match your specific housing needs: Complete the CUSTOM SEARCH form or Call:1-212-590-0545. Services Free for Buyers, Learn More. As a Foreigner can I Buy in NYC? 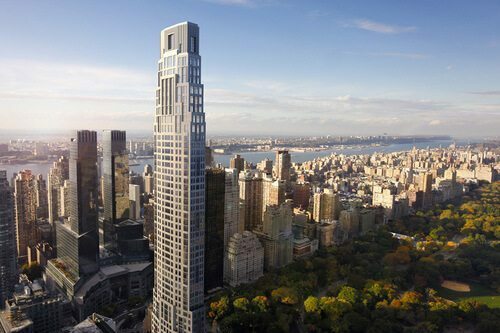 The New York real estate market is friendly towards international buyers. Indeed, countless foreign individuals and companies are taking advantage of this opportunity. New York condominiums and townhouses are the most popular choices among international buyers. Since purchasing coops and other special types of housing requires buyers to show US tax returns, these options are more challenging for foreigners. Can Foreigners Buy a Co-op? International buyers can purchase a co-op apartment, but it involves a more challenging process than buying a townhouse or condominium. Keep in mind that purchasing a co-op presents certain challenges for even a US buyer. Co-op Boards govern co-op buildings, and every purchaser must pass their approval. Focusing on the best interests of the co-op members (shareholders), these boards set the policies and guidelines and make all vital decisions about each building. It is beneficial to the members if purchasers are good neighbors and able to financially contribute to the upkeep of the building. To gain approval from most Co-op Boards, one must be employed in New York, have an exemplary US credit rating, and be able to present a US tax return. Co-op Boards are not legally required to explain their reasons for rejecting a potential buyer. Even if a foreign buyer gets approval, there are pros and cons to co-op ownership. Approval Period – In addition to the approval process being a difficult one, it also takes a considerable length of time which can range from weeks to months. Financing Restrictions – A co-op purchaser is restricted to a certain level of financing (a specific percentage of the sale price) usually equal to a maximum of 80%. Rental Restrictions – Purchasing a co-op may not be the perfect move for an investor. There are various restrictions on subletting co-op residences. These rules may forbid renting under any circumstance or allow it for a year or two but only after the owner has resided there for some years. Regulated Use – Certain regulations govern the use of a co-op. These rules can affect various aspects of a buyer’s life from the allowed number of guests to a proposed renovation. Selling Approval – Before selling (or renting, if allowed) a co-op, the owner needs approval from the Co-op Board. This requirement can affect the number of buyers as well as the asking price. Flip Taxes – When selling a co-op property, flip taxes are a reality. Their intended purpose is to deter speculator. Availability Since co-op apartments make up over three-quarters of all New York City real estate; there is a more extensive selection of available residences. Purchase Price – Compared to condo prices, the prices for co-op apartments are lower by ten to twenty percent. Potential buyers must consider that the monthly expenses may be higher. Monthly expenses include the owner’s share of the mortgage (if applicable), general maintenance, basic utilities, and real estate taxes. Co-op members can deduct certain expenses (real estate taxes or mortgage interest on their loan) from their taxable income. Residence Satisfaction – Although co-ops may not suit the investor, these apartments can be the perfect full-time or part-time residence. New York co-ops tend to be older buildings (pre-1920) but with age comes quality workmanship, superb details, and luxurious features. Spectacular fireplaces, airy spaces, beautiful detailing, and glorious gardens are part of the charm of a New York co-op apartment. A Manhattan condo offers a comfortable, contemporary lifestyle for individuals or families. Within a condominium, a buyer owns an apartment freehold but shares common areas with other residents. Condo living is gaining immense popularity with US residents as well as foreign buyers. In recent years, New York has seen the construction of new condos as well as the transformation of older buildings into modern condominiums. The new condos have the latest modern conveniences, feature luxurious touches, and offer a host of services. Also, buyers of new condos can receive depending on the property tremendous savings through tax relief for the initial 10-25 years. In the midst of an ever-growing market, New York condos comprise over one-quarter of all its real estate. Contact Us to find a newly-built condo or a state-of-the-art restoration. Secure Approval – Every condo has a Board, comprised of residents, which makes decisions about building issues such as use, repair, and rules. Every buyer has to be approved by the Board, but the process is more a formality than a complicated process. Minimum Restrictions – Condominiums have minimum restrictions regarding use or ownership. Part-time residence (pied-a-terre’s), as well as rental arrangements, are permitted under condo regulations. Attractive Investment – Even though condos are priced higher than co-ops, they make up for the difference in convenience and flexibility. In addition to providing an elegant style and excellent design, condominiums are an attractive investment. Since it is so easy to buy or sell a New York condo, more international buyers are eager to experience life in a Manhattan condominium. What are the ownership expenses? Whether one chooses an condo or a co-op, there will be expenses associated with the purchase. On the positive side, specific expenses can be deducted from an owner’s taxable income. Real estate taxes, as well as the interest payment resulting from the shared mortgage by co-op owners, may be used as a deduction. Investors can deduct real estate taxes and carry charges as business expenses in the year of occurrence. Real Estate Taxes – Depending on the property, real estate taxes can range from hundreds to thousands of dollars. Whether you are an average owner or an avid investor, seek information about decreasing your taxes through available deductions. Common Charges/Maintenance Fees – Common charges and maintenance fees are monthly expenses. While co-op owners are responsible for maintenance fees, condo owners pay common charges. Monthly charges will vary from building to building but can cost hundreds to thousands of dollars per month. A higher level of amenities in residence translates into a higher monthly charge ( $1/square foot on the more upper end). Tax abatement refers to programs which encourage New York developers to continue building and growing neighborhoods. Different properties qualify for various tax status. Elika agents can advise owners about the tax status of any NYC property. Tax Exemption Program – This program covers new buildings as well as certain restorations. A 421-A or 421-G tax abatement is for new buildings, and a J-51 applies to converted buildings. 421-A – The 421-A program phases out tax exemptions over 10 years. The real estate tax will increase 20% every second year until maturity (first and second year – 100% exempt, third and fourth year – 80% exempt, continuing to the tenth year). 421-G – The 421-G incentive applies to a specific area – below Murray Street in Manhattan. Eligible properties within this area will see tax benefits for 14 years. The lower payment is applicable in the initial 8-10 years and will phase out gradually until 2014. Additional Incentives – Some New York City buildings are eligible for lengthy abatement periods between 15-25 years. Specific factors such as location, availability of reasonably priced units, or receiving government assistance through loans and grants, will influence a building’s eligibility for long-term abatement incentives. Foreign buyers can obtain a mortgage to purchase New York City real estate. Most US banks have created programs to accommodate international buyers. Foreign buyers can finance between 65% and 75% of loans up to $1,000,000 and 60% of loans between $1,000,000-$2,000,000. International buyers will be asked to provide specific documents. Some institutions waive this proof, but in return, these buyers will be charged more in interest rates. Elika agents can match international buyers with mortgage specialists who can get the best deal for non-residents. Proper Visa or Foreign Passport Copy – US banks require proof that a potential buyer is allowed to enter the country. Credit References – At least four references from credible sources will be requested for mortgage loan applications. These documents must originate from professionals in the area of finance such as accountants, bankers, or insurance officials. Verification of Rent/Mortgage Payments – Proof of rent or mortgage payments are required for at least one year before the application. Adequate Closing Funds – Use the closing costs calculator to determine the complete list of expenses. Proof of Employment – Foreign buyers will always be asked to verify their employment. Tax liability is not the same for US residents and non-residents. Elika can point out the differences. Our professionals can guide you through the process. Federal Tax While the federal tax on long-term investments (holding the property for over a year) is 15% for US residents; foreigners pay 30%. FIRPTA Under the Foreign Investment in Real Property Tax Act of 1980 (FIRPTA), income tax is withheld immediately after a non-resident sells the property. New York State withholds almost 6.85% of the proceeds, and the Internal Revenue Service keeps 10% of the gain. Forms The IRS requires a Statement of Withholding on Dispositions by Foreign Persons of US Real Property Interests. New York State requests a Nonresident Real Property Estimated Income Tax Payment Form. We recommend seeking the expertise of a professional tax accountant to assist with these forms. For expert help, contact us. Should I Buy as a Company / LLC? Although there are benefits to buying through an LLC ( Limited Liability Company ), certain treaties between a foreign country and the US can minimize the advantages. Overseas buyers should enlist the help of a tax adviser specializing in international law. Elika can put a buyer in touch with a tax adviser who can assess individual situations. It takes approximately one week to form an LLC. The LLC must be established in the same state as the location of the property. An LLC can have unlimited membership including non-residents and US residents. The LLC is required to file tax returns (local, state, federal). What are the Brokerage Fees? When international buyers choose an Elika agent, there is zero commission to pay. Foreign buyers do not pay brokerage fees in NYC. The general rule for residential real estate sales is that the seller pays the brokerage fee which is then divided between the brokers for the seller and the buyer. We are compensated as any other Broker and paid through the proceeds of the sale. Customarily, fees for real estate brokerage have been included in the purchase price of the property. This means that a typical purchase will result in no additional out-of-pocket expenses for you! When an apartment sells, half of the 6% commission is paid to the real estate company that brings in the Buyer and the other half is kept by the company listing the property for sale, representing the Seller. What is the best way to find a property? Contact Us! As a member of the Real Estate Board of New York and the National and New York Realtor Organizations, Elika has access to all properties in the NYC marketplace. An Elika agent can show you any available New York property. In addition to our professional resources, Elika provides unbiased advise, history and a detailed comparable market analysis when you have decided upon specific property. Buying real estate is a complex process involving selection of attorneys and bankers, presentation of documents, property research, as well as searches for rules and procedures, and meetings with brokers. Foreign buyers should not put their trust in general public sources of information. Elika has the expertise/experience and the latest updated information about the NYC real estate market. Elika provides personalized service for each international buyer. Within New York, a buyers commission is also paid by the seller. 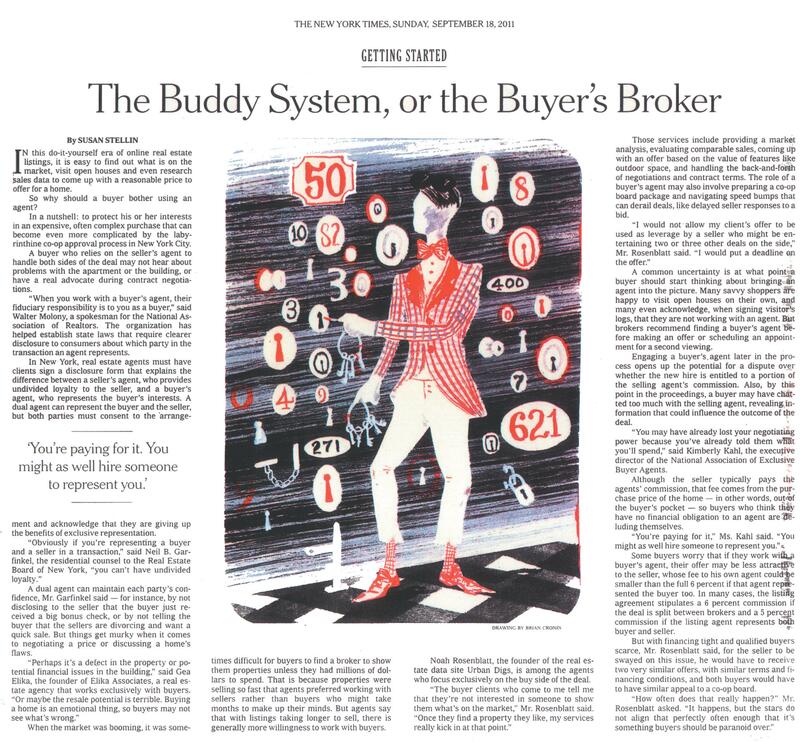 The majority of sellers have a broker. Since having an agent offers protection, buyers and sellers should have their brokers. A seller’s broker will not represent a buyer’s rights. Foreign buyers need a broker to work specifically on their behalf. A broker can request concessions or intercede for a reduction in price. Having an agent in your corner is essential in finding the right property for the right price. Since a seller pays for a buyer’s broker, there is no need for a buyer to go without the proper protection. Buyers should not risk making expensive mistakes by doing it on their own. Foreign buyers need the services of a qualified broker. Using a broker makes buying a less time-consuming process. 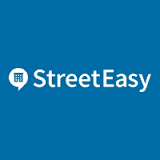 Brokers have access to every NYC property in the marketplace. Brokers can help with the presentation of documents and applications. Brokers coordinate the team of professionals needed to complete a sale. Brokers simplify the buying process. How to Check a Property Title? Buyers and sellers need the services of an attorney to perform the title search, obtain insurance, and look for violations/liens on the building as well as negotiate a contract ( the initial agreement which outlines the deposit). In addition, other professionals are needed to check the important details. Appraisers discover the fair market value of an NYC property. Architects handle the technical side and look into the property’s condition. Surveyors check on the measurements of the property, and for that final step, mortgage brokers help buyers obtain loans. Elika connects foreign buyers with the best professionals in the industry. The new buyer’s details are recorded at closing by the buyer’s attorney who will submit them to the New York City Register. At purchase, the documents are photographed, copied, and filed for future reference. Do you provide property management? Yes, Elika Management ensures a hassle-free process when investing in the largest real estate market in the world. New York City is an investment goldmine, offering high returns as property values regularly increase. We manage every aspect of buying, leasing and selling property in New York City, so you enjoy a profitable and stress-free experience. Elika Management Corp. also assists in finding tenants should you wish to rent out your investment property, and provides full property management services. Whether you live locally or abroad, we specialize in managing individual condo and co-op units, so we can provide the hands-on service and staff to meet the needs of our discerning clientele. Receive a free, short list of properties that best match your needs curated by an Elika expert. We'd love to help you find your New York City home or investment.